Will These Topicals Reverse Your Hair Loss? In the last decade, if there’s anything I’ve learned about topicals, it’s this: topicals are a shot in the dark. What works for one person does not work for 99% of others. I’ve experimented with almost all of the above topicals, and for months at a time. None of them helped regrow my hair. With that said, my story isn’t everyone’s story. Sometimes people get lucky. Sometimes a person uncovers a topical that gives them significant regrowth. But why is that? How can one topical regrow hair for one person but not for everyone else? Interestingly, our genes and gene expression also influence how well we respond to hair loss drugs. Studies show that Propecia is more effective for those with certain gene variants (polymorphisms). For reasons not yet understood, people who have these polymorphisms and take Propecia tend to recover more hair than those without them. 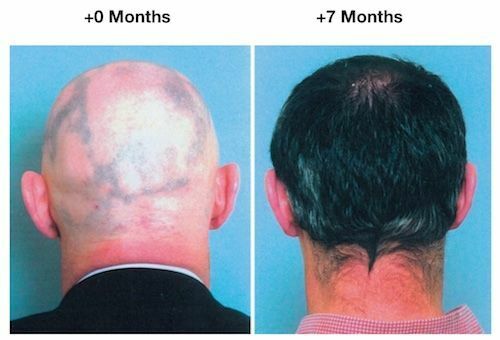 We can apply that same logic to any hair loss topical – like Rogaine. All of these markers link back to our genes (and gene expression). Genetics likely explains why some men and women using Rogaine regrow some hair, while others (like myself) see no changes at all. But this is just one reason. That’s not all that’s going on. There are a million different reasons why someone starts losing their hair. Calcification, fibrosis, and increased scalp DHT all play a huge role in developing pattern hair loss… But all three of these things have thousands of triggers. Unfortunately, most hair loss topicals target just one trigger of these thousands of possibilities. There are thousands of triggers for hair loss. But most hair loss topicals target just one (or a few) of these triggers. So how likely is it that we pick a topical that also happens to target the same triggers of our own hair loss? This sort of thing happens in hair loss forums all the time. Here are two recent examples. 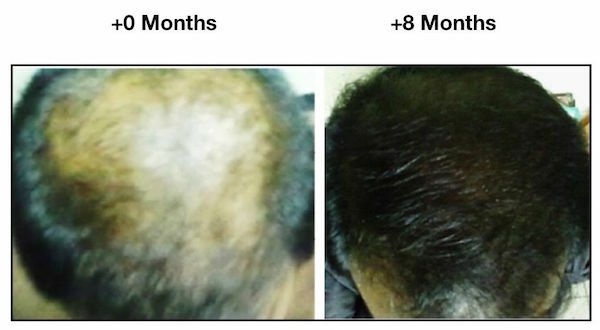 This study got posted on hair loss forums, and within days, its popularity exploded. Dozens of forum users decided to commit to the methodology for eight months and try to validate its results. After a month people’s excitement started to sizzle. After two months the thread got buried to the forum’s second page. After three months people forgot the study had ever been posted. And after eight months none of the “testers” posted a single before-after picture. Of the testers who finished the experiment (to my knowledge – just two), none claimed any results. For purposes of this article, let’s assume that of the testers who tried this topical, they tried it correctly and for the entire eight months, and it still didn’t work. Let’s forget about the possibility that most testers who faded away probably didn’t even commit to the regimen (which is probably the reality). Why would this lard topical work for the author but not everyone else? Pattern hair loss is a broad term, so let’s break it down. Interestingly, our type of hair loss might tell us more about its triggers. Hair follicles are surrounded by a fatty layer known as subcutaneous fat. Subcutaneous fat helps maintain the health and size of a follicle. If this fatty layer erodes, a follicle no longer has the cushion needed to support its size, and so it begins to shrink. A common sign of decreased subcutaneous fat in our scalps is thinner, tighter scalp skin. As men age, androgens like testosterone and DHT may encourage the bones in their scalps to thicken or grow larger. This is called skull expansion, and some people theorize that skull expansion actually causes hair loss by reducing blood flow to thinning regions. The theory is that skull bone growth might decrease blood supply to parts of our scalps, or even indicate advanced states of calcification. For evidence, just look at photos of most balding men. Many have a “bulge” starting at the midline of their foreheads (skull expansion). Circling back to the types of hair loss, is there anything unique about diffuse versus pattern thinners? Yes. In my experience working with hundreds of readers, I’ve observed two major differences. Diffuse thinners tend not to have much skull expansion. Remember: one sign of eroded subcutaneous fat is tighter, thinner skin. So based on these symptoms, what is one potential “trigger” of hair loss for diffuse thinners? An eroded subcutaneous fat layer. Now let’s get back to this pig lard study. What can we glean from the author’s “before” photo? Based on the pattern of his hair loss, he also looks like a diffuse thinner. Interestingly, there’s evidence that fat-based hair loss topicals might help increase the density of our scalp’s subcutaneous fat through hydration. This includes emu oil, coconut oil, and yes – even pig lard. This might explain why the author got such great results. The author is a diffuse thinner. Diffuse thinners tend to suffer from subcutaneous fat erosion. Any fat-based topical that helps increase the scalp’s subcutaneous fat should also help diffuse thinners. Now let’s go back to the “testers” on that hair loss forum. Chances are they weren’t diffuse thinners. Chances are they were typical pattern hair loss sufferers. Since those with typical pattern recession tend to also show signs of skull expansion, it’s likely that their hair loss is more rooted in triggers beyond subcutaneous fat erosion (like calcification). As a result, those with typical pattern hair loss probably won’t experience much benefit from fat-based topicals that target subcutaneous fat. Instead, these people need to target calcification. If you’re a diffuse thinner with minimal skull expansion and you want to try a topical, go for fat-based topicals like emu oil, lard, butter, or coconut oil. Use them nightly, leave them in as you sleep, and test for a year before determining whether they’re helping. Many years ago researchers conducted a study on aromatherapy essential oils’ effects on hair growth for people with Alopecia Areata. Alopecia Areata is an autoimmune disease in which the body attacks the hair follicle, often leading to hair fall in patches and everywhere (even on the scalp sides). The researchers tested a cocktail of thyme, rosemary, lavender, and cedarwood essential oils inside a mixture of jojoba and grapeseed. The instruction: massage these oils into the scalp, daily, for 2+ minutes. Again, this study made its rounds through hair loss forums. People got excited. Many pattern hair loss sufferers said they would attempt to replicate the study and try it themselves. Months later those threads went quiet. We never saw any before-after photos from those who said they’d commit to the regimen. Why did this essential oil topical work for those in the study and not for the forum testers? This one is kind of obvious. The study was for people with alopecia areata – not male pattern hair loss. Alopecia areata is an autoimmune disease where the body begins recognizing hair follicles as invaders, and then begins to attack and destroy them. Those with alopecia areata don’t necessarily have any of the scalp conditions associated with male pattern baldness (calcification, fibrosis, higher tissue DHT, etc.). As such, alopecia areata sufferers and male pattern hair loss sufferers responder better to different types of treatment. If you’re suffering from alopecia areata, this topical might be worth trying. But if you’re suffering from regular pattern hair loss, don’t expect an essential oil blend to work any miracles. I don’t have any topical recommendations. I think most are a waste of money, and that most don’t target the two most chronic, progressive conditions of hair loss – calcification and fibrosis. Test it for at least four or five months before deciding whether it’s helpful. Don’t change a dozen other things in your regimen at the same time. Otherwise, you won’t have any idea what’s helping. In the next few weeks, I’ll have a post on which topicals encourage hair regrowth and why. The key to an effective topical: something known as autophagy. More on this later. Does this mean that diffuse thinners do not have diet, calcification and fibrosis issues ? And what if a Diffuse thinner was to do the massage aswell as topical treatments such as coconut oil shampoo, emu oil ect ? Im guessing the tighter skin which erodes the fat is caused by calcification and fibrosis which allows DHT to erode the fat. So a massage and topical would have substantial results ? Thank you. And great questions. There haven’t yet been enough studies to differentiate the causes of diffuse vs. pattern thinning. Based on the available evidence and my experience working with readers, it seems that skull expansion is significantly less pronounced (and sometimes nonexistent) in diffuse thinners versus those with pattern recession. With that said, I still think DHT, calcification, and fibrosis are implicated in both cases. It just might be that someone’s type of thinning – diffuse or pattern recession – is more indicative of the weight of those causes (ex: diffuse thinners might have less androgen receptor density but those androgren receptors could be spread more evenly across the scalp, or diffuse thinners might have more fibrosis and less calcification versus those with pattern recession). Unfortunately we won’t know for sure without more data. But based off the results of diffuse thinners using fat-based topicals, I think it’s safe to say that 1) eroded subcutaneous fat is a big issue for diffuse thinners, and 2) these topicals might help. To answer your second question – yes, I think fat-based topicals like coconut or emu oil (applied topically, left in overnight, every night) will be synergistic with the massages. Are fat-based topicals good MPb with danddruff symptoms? or do they help produce more sebum/collagen? Thanks Panos. To answer your questions, I’m not sure if fat-based topicals will help with dandruff. And I think fat-based topicals might actually downregulate scalp sebum production in the long-run. As far as collagen – there’s more evidence that fat-based topicals increase the density of subcutaneous fat where they’re applied – but less so on the ability of these topicals to remodel collagen. That doesn’t mean it’s impossible – it’s just not yet studied (as far as I know). The big takeaway is that if you’re a diffuse thinner, then you’re likely also suffering from an eroded subcutaneous fat layer – in which case fat-based topicals can help. It is a very interesting article regarding topicals.Your article are always very logical so looking forward to your next article on various topicals. Meanwhile I have this doubt.Since scalp calcification & fibrosis increases the activity of androgen receptors & also the increased DHT cause loss of subcutaneous Fat layer below scalp.So will in turn these massages & topicals will over time balance the eroded scalp fat.Also what dietery changes can cause fat increase in particular area of scalp.I beilive it’s the muscle activity & collogen( like broths)that may help with this but your advice in this regard will be very helpful. Thank you Ankur. It’s my belief that the massages firstly focus on resolving the fibrosis and calcification that restricts blood flow to the follicles – which thereby allows dormant follicles to regrow. With that said, it’s also possible (and actually, very likely) that subcutaneous fat erosion is the end-result of calcification and perifollicular fibrosis. That means that if you resolve the calcification and fibrosis, there’s a chance the subcutaneous fat layer may also make a significant step toward recovery. Fat-based topicals might help encourage this process – at least based on the available evidence. But the evidence is very limited on any dietary changes (aside from weight gain) actually increasing the density of subcutaneous fat anywhere on the body. With that said, collagen supplementation and bone broths have been shown to help increase the hydration of the skin, and in doing so, increase the density of subcutaneous fat through hydration. Collagen and bone broths are also great for a million other reasons. If you’re looking to increase the density of the scalp’s subcutaneous fat – doing the massages + the fat-based topcials + the dietary recommendations in the book should help tremendously. I hope this helps! what about Apple Polyphenols ?? There was a lot of buzz around this after Japanese researchers discovered it had amazing effects on MPB. And small doeses could even bring amazing results. It was said to be more twice more powerful than Minox without side effects. It’s mentioned briefly in the article, but apple polyphenols decrease the expression of transforming growth factor beta, which may help prevent fibrosis. I’m sure it’ll help some people – but based on my experience, no single topical seems to regrow hair for the majority. I am really amazed about your knowledge and resourcefulness! You are doing great job of educating others and helping them achieve success in hair health. Today I bought your eBook with video and started to implement those massage techniques. Everything feels the way you described in your eBook. Looking forward for some amazing results! I have a question regarding one topical. It contains Saw Palmetto, Green Rooibos, Licorice Root extract. I am not sure, but I think I see some small hair regrowth after those procedures so far. How do you think should I use that scalp tonic and shampoo brush along with your scalp massage and how/when you think I can use it? I know that you are not a doctor, however I would really like to hear your opinion on that! Looking forward to regrowth my hair with your explained method! Hey Rolandas – thanks for your support. You can certainly try that topical and see how it goes. I don’t see any ingredients of concern. Saw palmetto taken orally is a 5-AR inhibitor and can reduce total DHT levels within the body. I’m not sure if it’s as effective when it’s a topical, but there’s no reason why you shouldn’t try it out. Twice per day is fine – and maybe leave it in overnight if you can. The rubber massager looks fine too – though I think for massaging, nothing replaces your own hands (hands are more dynamic). If you use the rubber massager, I’d try using it to replace the presses (the demonstration video will show you more of the specifics). I look forward to your progress! Please keep in touch. Hi Rob – have you looked into topical caffeine for MPB? And should you expect regrowth once the scalp is elastic again? The physiology of the prostate DOES NOT return to normal after stopping Finasteride. In other words, when you take Finasteride, you inhibit 5-AR but you increase AR expression. The net result: less DHT in the blood, prostate, and scalp. But when you stop Finasteride, you stop inhibiting 5-AR activity, but your androgen receptor expressin may not normalize… You might be stuck with a higher androgen receptor activity post treatment. The result? More DHT in the blood, prostate, and scalp after stopping treatment. That’s no good for our hair. Is the same relationship true for topical caffeine? We don’t yet know. But if it is true, this means that the effects of a caffeine topical may only be limited to its continued use, and once you stop, your hair loss may actually increase. So the jury is still out on caffeine as a topical. Anecdotally I’ve heard of mixed / good results. But as a long-term solution, I’m less convinced. Only more data will tell. And to answer your question about scalp elasticity — it’s complicated. In most cases, an increase in elasticity will stop hair loss in its tracks, and lead to thickening and regrowth (the levels of which vary depending on each individual case). But depending on the severity of your loss, sometimes it takes an extra “nudge” to break through and reverse any pre-existing fibrotic tissue. This usually involves additional efforts for wounding/healing and mechanical stimulation – either via dermarolling + a topical or otherwise. great site you’ve got here. Amazing information. Regarding the fat-based topical, would you recommend using castor oil? Also, if using coconut oil, should it be warmed (to become liquid) before applying it? Do all these topicals for diffuse thinning should be applied only on the top of the head (i.e. affected area) or everywhere including sides, back, and nape? You can absolutely use castor oil. It’s antimicrobial, may increase PGE2, and contains small amounts of linoleic acid — all of which tend to have pro-hair effects. In terms of applying coconut oil — it shouldn’t matter whether or not you warm it, so long as you can spread it across your scalp (your body heat should warm the oil to a spreadable temperature anyway). And as far as the application itself — the case studies with results all suggest that we should put this oil all over the scalp (even the places we’re not balding). I tried it yesterday and my hair was really oily in the morning. I’ve seen that shampooing is not as recommended as we thought. How could I wash my hair next morning? just water or any advice on other way? Hey David — in cases where someone is using a fat-based topical, it’s okay to use shampoo if your hair still feels oily after a water rinse. In this case, the benefits of the topical likely outweigh the cons. Otherwise, hotter water does a much better job than colder water at rinsing out topicals. So you can also experiment with temperature. I was wondering if applying the topical twice per day would do a better job for hydrating the scalp and increase eroded subcutaneous fat. You can certainly try applying it twice per day — so long as you’re okay with having the oils in your scalp / hair during working hours. I’m working with one reader who shaved his head and is doing the book’s regimen + a coconut oil + crushed ginger root twice daily. He lathers his entire scalp and wears a hat to work. He’s also seeing the fastest regrowth of anyone with whom I’m currently working. So — there’s at least anecdotal evidence that twice daily applications seem to have merit. First time I discover your articles and I find them very enlightening. Your symptoms sound more in-line with a fungal infection, or seborrheic dermatitis. I was reading this answer to Holta and I have the same symptoms, which are also the same of many users from several forums who suffers from MPB. I agree that is not so common to feel pain and soreness while suffering of MPB but a lot of people is experiencing that. In my case my galea is very tight + eroded fat (thin skin, very close to the bone) + MPB (hair loss mostly in the galea region and hairline). Do you believe that besides MPB could I have something else wrong ? Hey Matt — it’s certainly possible other health conditions could contribute to or exacerbate your hair loss — but it’s impossible for me to give definitive answers without knowing more about your situation. Based on what you’ve described, it just sounds like you’re expressing common symptoms that coincide with MPB. Aside from that, I still stand by my advice to Holta — if there’s significant pain, something else could be going on. Thanks a lot for your feedback. In fact I have been suffering for a few years now from yeast infection…i don’t know if that is related somehow to your suggestion of fungal infection, but I guess a simple test can show it. Anyway, my condition shows an unbalanced intestine flora which maybe worsen my condition . I was thinking a zinc supplement might help(thanks for your article about it). Please let me know if you have any idea about it. Hey Harpreet — I sent you an email / replied to your comments in the other articles with answers! I hope this helps. I’ve been reading your articles for the past months now and have learnt about many of your theories and gathered as much knowledge as I could. I’m currently a college student and in a very troubling situation. I started minoxidil (once a day) at 18 as I thought my hair was extremely thin. In reality, it was really just normal, thin asian hair and there were no signs of balding. Fast forward 3 years, I felt the itch in minoxidil was no longer worth it and my hair was progressively getting thinner (sides were receeding too). I then made the choice of stopping it cold turkey, close to a year ago. The shed was okay until 4 months in and things started getting worse. I went on and off minoxidil after that and am currently just 4 months from complete minoxidil abstainance. I am also 5 months in Deteumescence, following your protocol as read from on JD Moyer’s site. Currently, my hair is in its worst state till date, with significant scalp showing and a general thinning across the entire scalp (areas where minoxidil was applied). Would you advice going back on minoxidil or sticking to deteumescene for at least 1 year? I’m just afraid of an event where it becomes a case of minoxidil induced baldness . If your scalp sides are still thinning, I’d suggest a blood test to rule out hyperparathyroidism. That means serum readings of PTH, TSH, calcium, and vitamin D. Oftentimes, overall hair thinning is a sign of secondary hyperparathyroidism. It’s very treatable with a procedure, and oftentimes, the hair comes back post-procedure. So get those tests! And let me know your results. This would also explain why you’re not responding to minoxidil — your hair thinning may not be MPB. I am asking a lot these last days, but there is just so much information. I am excited at how much time you have invested, the advancements you have made and translating that into help and hope for many people that feel insecure with baldness condition. I am 6 weeks with the massages now. My scalp turned really dry and I noticed that (since the scalp is dry), the massages (pinching) are leaving residual marks where the wrinkles form more frequently. What do you recommend to avoid these marks? Maybe have wet hair or maybe an oil? Any suggestions on topicals that would help relieve scalp itch/ache that I have? I have normal MPB and am doing your massage techniques along with changing my diet to be close with what you wrote. Also, any update on the follow-up article to this one on autophagy?